Palin's bookers are said to be asking for $100,000 per speech, but an industry expert tells Page Six: "The big lecture buyers in the US are paralyzed with fear about booking her, basically because they think she is a blithering idiot." ..."Palin is so uninteresting to so many groups -- unless they are interested in moose hunting," said our insider. "What does she have to say? She can't even describe what she reads." Employment Insurance Recipients on the Decline? CTV News reported Monday that the number of Canadian Employment Insurance recipients has dropped for the first time in a year. The rate of unemployment has been on the decline since July, according to Statistics Canada, which reported that the number of workers on EI benefits decreased by 3.8 percent from June. The Province of Ontario has filed a $50 billion dollar suit against tobacco companies, reports the Toronto Star. The suit was filed to recover the costs associated with treating smoke-related illnesses going back as far as 1955. If Ontario successfully proves its allegations, tobacco companies will have to pay damages based on their sale of cigarettes in the marketplace. According to The Star, British Columbia is also suing tobacco companies. A military coup in America to deal with "the Obama problem?" ...Military intervention is what Obama’s exponentially accelerating agenda for “fundamental change” toward a Marxist state is inviting upon America. A coup is not an ideal option, but Obama’s radical ideal is not acceptable or reversible. A family are in a court custody battle over a pet sheep...A judge at the county court in Mold, North Wales, will decide next week on the sheep’s rightful owner. For all the woolly details, see Family in Custody Battle over Pet Pig from Times Online. Warning - there are many tears - and the British Return of Goods Act - involved. More here from CBC News. A short note that I'll be participating in an upcoming Law Society of Upper Canada teleseminar, Security for Lawyers in a Wired World, on October 16, 2009. This CLE programme will tackle emerging confidentiality and security issues for the profession, with focus on "the steps you need to take to protect yourself and your clients in this new technology-driven world." 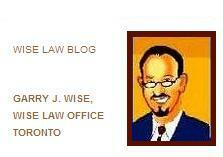 I'm scheduled to address Cloud Computing with David Whelan of the LSUC. David Canton will be moderating the programme. I hope that some of our readers will be able to participate. I expect that there will be a great deal of useful, practical information from the panel. Members of the profession can register online for the programme. It's Monday again, and off we must go with this week's Recently Tweeted recap. As always, we invite you to follow Wise Law on Twitter, where we have up-to-the-minute postings of the many stories time doesn't permit us to address here at the Blog. If mandatory retirement is not dead, it was certainly dealt a fatal blow by a Canadian Human Rights Tribunal ruling in two cases decided August 28, 2009. George Vilven and Robert Kelly are two Air Canada pilots who were forced to retire at age 60. Both Vilven and Kelly felt that being forced to retire when they were clearly able to perform their jobs was obvious discrimination. 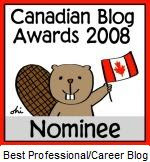 S. 15(1)(c) of the Canadian Human Rights Act, however, gave employers in the federally regulated sphere a defence to a complaint of discrimination if they could show there was a “normal retirement age” in a particular industry. Yet, s. 15(1)(c) of the Canadian Human Rights Act remained anomalous as jurisdictions from British Columbia to Newfoundland abandoned mandatory retirement. As the workforce got older it made less sense to force workers to retire, especially when some wanted or needed to continue working. It has been a difficult fight for both pilots. The case was first heard at the Canadian Human Rights Tribunal in the summer of 2007. The Tribunal then found that Air Canada had indeed shown there was a normal retirement age of 60 in the airline industry. The Tribunal rejected the notion that s.15(1)(c) was unconstitutional since, they believed, there was no affront to a person’s dignity when a generous pension plan was negotiated between an employer and a union. The pilots applied to the Federal Court of Canada for judicial review on the grounds that the constitutional question was not properly considered. The Federal Court agreed and haughtily sent the case back to the Tribunal, with step by step notes as to how to properly consider the equality guarantee under the Charter. The second time around the Tribunal got it right, finding that s.15(1)(c) could not be justified as a reasonable limit on equality rights. The Tribunal therefore ordered the pilots’ reinstatement with full benefits and entitlements. Before this decision mandatory retirement still affected 10% of the Canadian workforce. Now employers in the federal sphere are scrambling to navigate the implications of this decision – and workers who have been adversely affected by mandatory retirement have finally been vindicated by the Canadian Human Rights Tribunal. The full text of this ruling is available online. See: George Vilven and Canadian Human Rights Commission and Robert Neil Kelly and Canadian Human Rights Commission, 2009 CHRT 24 (CanLII). Air Canada announced today that it is appealing the recent CHRT decision that ruled that s.15(1)(c) was unconstitutional. Air Canada states that the Tribunal did not apply the proper rules as set out by the Supreme Court of Canada which permit mandatory retirement when such a limit is collectively bargained. The Pilots say the are ready for the fight. Stay tuned, it looks as though there may be one more chapter to this story. Stephen Ellis practises Employment Law in Toronto. Quote of the Day: Legal Aid a "Triumph of Equality"
Elected politicians have to declare themselves on access to justice for the poor. Governments that genuinely support equality must provide stable, long-term funding for legal aid programs. No waffling, half-measures or hedging will do. Legal aid is modern social justice at its best. It is a triumph of equality when good lawyers accept such cases. It means that no matter how poor a person or how disorganized their life, a talented lawyer will speak for them. In the legal system, at least, poverty takes a back seat. This beautiful ideal shows the rest of the world how we define justice. It's time to restore its sheen. As they say in the video, Mazel Tov! I must confess to at least a grudging admiration for the unyielding, malicious genius demonstrated by spammers and black-hatters in their efforts to tempt - or frighten - unwitting recipients into opening virus-laden emails. Their ability to ride the waves - in real time - of the hot trends, fashions, issues and anxieties of the the day to grab attention would impress any marketing professional. Perhaps the spammer's subject line will come to be seen as an underground art form, some day. On a related note (as to the issue of whether I should even be writing about this email), I've been having a good discussion today with my friend Michael Carabash about whether solicitor and client confidentiality attaches to unsolicited spam email of a professional nature received by lawyers. My take is that it generally does. We may not owe a duty of care to unsolicited spammers, but we generally do owe a duty of confidentiality with respect to all emails received at our professional addresses where it would be reasonable to assume confidentiality is expected. Where the email contains what may be a bogus "request for legal representation" that could well be the introductory salvo in an attempted fraud (we get these suspicious emails quite frequently), the issue becomes more complex. Nonetheless, I'd still come down uncompromisingly on the side of maintaining confidentiality as to those who contact us - absent compelling, if not absolute, proof of fraud. I've published the identifying "IRS" information above because of its "no-reply" email address, which eliminates any concern that the email could be from a real person, or alternatively, be a spoof of a real person's identifying information. As well, it does not appear to be related to legal services at all. Otherwise, I would not ordinarily consider publishing or disclosing it. His goaltending in tonight's pre-season loss removes all doubt about the Monster's ultimate future in Toronto - Sabres 7, Leafs 6. Video: Glen Beck Dodges on "White Culture"
I'm sure we can expect a colourful, no-holds-barred primary campaign from Linda, Vince, Stephanie and Shane. Anyone else looking forward to a series of steel-cage debates on pay per view? I'm wondering who she will choose as her campaign manager - Paul Bearer or the "Mouth of the South," Jimmy Hart? As is often the case in U.S. politics, truth really can be stranger than fiction. 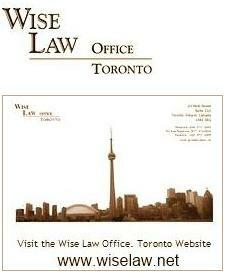 TORONTO, ONTARIO--(Marketwire - Sept. 24, 2009) - The Law Society and the Ontario Courts have established Civility Complaints Protocols designed to improve civility and professionalism among lawyers and paralegals appearing in court proceedings. The Civility Complaints Protocols were developed in consultation with the Chief Justices of the Court of Appeal for Ontario, the Superior Court of Justice and the Ontario Court of Justice. The Civility Complaints Protocols announced today are part of the Law Society's drive to improve civility and professionalism among lawyers and paralegals. Uncivil or unprofessional behaviour during the course of a trial adversely impacts the administration of justice. To develop the protocols, the Law Society consulted with the Chief Justices of the Court of Appeal for Ontario, the Superior Court of Justice. The protocols ensure that not only is there an accessible means for judges to refer instances of inappropriate conduct to Law Society regulatory processes, but also establish a mentoring option for less serious matters. 3. to refer the misconduct to the Law Society with a request for mentoring. Arrangements are being made for there to be panels of senior members of the bar to provide mentoring to lawyers on appropriate courtroom conduct. Mentoring can show the lawyer or paralegal appropriate responses to the pressures of appearing in court. The agreement of lawyers to provide mentoring demonstrates the profession's commitment to improving civility and professionalism. Discussions on establishing mentoring relationships for paralegals are in progress. A clerk... said that the staples twice drew blood. Netanyahu to U.N.: Have You No Shame? Also see: Canada boycotts Ahmadinejad's speech from CTV News. The February 5, 2009 Order of Master Breitkreuz from Knott v. Sutherland says that the plaintiffs could substitutionally serve one of the multiple defendants by publication of a notice in the newspaper, by forwarding a copy of the statement of claim to the human resources department where the defendant (formerly) worked, and also by sending notice of the action to the Facebook profile of the defendant. Precedent for service in civil matters via Facebook exists from Australia and New Zealand, but I am not aware of this being ordered previously in Alberta. Rock and roll's testimony to eternal youth, Bruce Springsteen, turned 60 Wednesday. To mark the occasion, here's a clip from a July,1984 Toronto concert - a concert I remember well. I was an articling student then, managing somehow to get out of the office in time to make it to all the shows Bruce had on in T.O. that week. If there was one potent message coming from the stage of the old CNE Stadium those nights, it was that we can all do pretty much anything we really set our minds to. No retreat, baby... no surrender.